Everyone has been there at some point. How do I get started? Or how do I get back into it having been away for so long? Well, the following women have all found themselves in that same situation and are on hand to offer their support, help and encouragement. 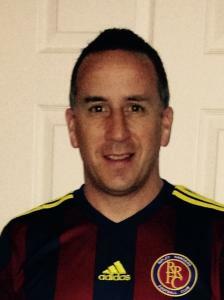 Instructor at GymFit - Ripley -"Pushing to help and inspire everyone I can." "I first got into fitness around 4 years ago after having my 3rd child. I didn't feel good about myself, so decided it was time to change. I went on a diet and started doing exercising at home, Losing around 4 stone when I started going to local classes. "I soon got the opportunity to work as an instructor, it was incredible and before I knew it I had done my level 2 instructor course, Spin course and enrolled in my personal training qualification which I am loving! The support from my colleagues has been nothing short of amazing. "I now take Spin, Bounce, TRX, Boxfit and Circuits at GymFit Ripley. I absolutely love my job and helping people with their fitness goals. GymFit is so friendly and everyone is made to feel very welcome, I love the challenges and the positive feedback from everyone constantly encourages me. I'm very grateful of the opportunities fitness has given me. "It's very important to me that women of Ripley feel they are made welcome and getting the best help and advice possible to reach their fitness goals and smash them. I am always around at GymFit so please if you just want to get into fitness or you want to go forward and need that gentle push please come in. "Never be afraid to try, 2 years ago If you had told me I would be working at a gym, taking classes and helping women I would have said never. But here I am, I love what I do and will keep pushing to help and inspire everyone I can." Walk Leader - Ripley Walking for Health - "It's a good opportunity to meet people and make new friends." 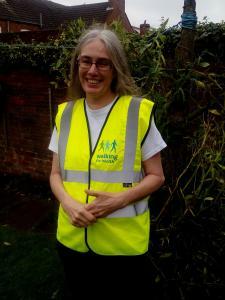 "I am one of the Walk Leaders with the Walking for Health Group which meets at Ripley Leisure Centre each week. I joined the scheme in 2015 as I am a firm believer in the benefits of walking outdoors for both physical and mental wellbeing and enjoy walking myself. "Our walks began on Fridays in June 2015 with short walks starting and finishing at the Leisure Centre. They are ideal for anyone new to exercise or returning to it after injury, or just wanting company and to feel safe. We go for a stroll around the area and afterwards some of our group will go for refreshments in town. The walks take place in all weathers so be prepared with a waterproof or some sun cream! It's easy walking and no stiles are involved. It's a good opportunity to meet people and make new friends. "After 6 months some of our walkers wanted a bit more of a challenge so our Tuesday progression walk was formed starting in January 2016. These walks are a little bit longer and may involve the odd stile and a bit of mud. We also wanted to explore Waingroves Woodland but it was just a little too far away to manage starting and finishing at the Leisure Centre so from May 2016 on the first Tuesday of each month we meet in the car park at the Marquis of Ormonde, Codnor Denby Lane to have a wander round Waingroves Woodland. It is also very handy if you want to stay for lunch at the Marquis which serves delicious meals (we've tried them!). "on the first Tuesday of each month meet at the Marquis of Ormonde at 11am for a stroll around Waingroves Woodland (they let us park for free at the pub) and every other Tuesday meet at 11am at Ripley Leisure Centre. These walks last about 90 minutes. "We are a small friendly walking group and would love to meet you. For more information you can email me at JeanBarber@pfpleisure.org or you can telephone the Leisure Centre on 01773 514727 and leave a message for me to contact you." Zoe Davies- Ripley Amateur Boxing Club - " Get fit as a family"
"I've been involved in the club for six years now, originally attending with my children. I started joining in the sessions with them and then my partner Andy joined to, it was a great way to get fit as a family! We started volunteering at the club and over the last few years I have taken my level 2 boxing coaches award, am a registered Boxercise instructor, have a level 3 sports coaching diploma and many other courses including coaching young people and disabled people in sport. "The classes are great fun and boxing fitness is known to boost confidence and self-esteem. As well as the open sessions we also run ladies only classes on a Thursday. The classes suit all abilities and fitness levels, gloves and pads are provided, you just need to turn up!" Sue Wain - Tai Chi teacher at Ripley Tai Chi Club - "the Tai Chi bond is nothing less than miraculous." "I have been studying Yang Family Traditional Tai Chi & Qi Gong since 2009 and it has become a way of life. When first venturing in to the Ripley Tai Chi Club I had no expectations and just saw it as time out for myself, however, I soon realized that it was much more than that and before long I was hooked. "At the time I had a few health issues, after spending years suffering with a trapped nerve and spending lots of time and money on chiropractors and physio. I was eventually told by my doctor that the only way forward was spinal surgery. Thankfully I started practising Tai Chi before I had the surgery. Within 3-4 months I found the pain was subsiding, I found that I could actually move my neck and shoulders more easily and within a year I was virtually pain free. I must stress, this was my experience and obviously every person's health situation is different and (as I did) it's very important one explores all the available medical options. But, for me, practising tai chi helped enormously. "Tai Chi is also a very useful technique for stress and anxiety. I found the Tai Chi Form a welcome retreat from the turmoil and stress when my mother was ill. It is amazing how just an hour or two can be so beneficial for the mind, body and soul. While practising the Tai Chi I can easily put all other outside trials and tribulations out of mind. When one knows the form well, it is easy to go in to a meditative state where nothing else exists apart from you and the Tai Chi movements. Tai Chi is known by many as Moving Meditation. This is great for people who struggle to sit quiet for any length of time. "Tai Chi can also help with many breathing problems. You learn to breathe naturally with the movements. I have found that my breathing is now more controlled and I am physically much stronger due to the slow movements and knowledge I have gained regarding muscle strength, movement and balance. Tai chi can be practised at any age. Our clubs are generally 16+, but there is no upper age limit. "Because of the incredible influence Tai Chi has had on my life, whilst making the journey from student to teacher, I now love the opportunity to pass on the teachings to anyone who feels they could benefit. "I have also made some very special friends and I am sure that we will be lifelong friends as the Tai Chi bond is nothing less than miraculous." Karrie's Pole Fitness - "Everyone's a beginner once"
"Wearing shorts, not having upper body strength, wanting to lose weight first, worried they're beginners, worried they're too old, the list goes on. But in reality, after one or two lessons you quickly learn that everyone is wearing the same thing so no one is looking at legs as you need them to grip the pole, women generally do not have good upper body strength as it's built up by doing pole and aerial hoop, pole dancing is fitness so helps to tone up and lose weight, everyone was a beginner once, our ages vary from 12-59 and our classes are a safe, friendly and encouraging! "And if you really don't fancy getting your legs out then Aerial Hoop is great because you need to wear leggings, our Saturday morning class is great for beginners too!" For Aerial Hoop go to www.karriespolefit.co.uk Fill out personal information/waivers/medical history. Claim first aerial hoop class (£5) under membership then book the class on the date and time that you want. Fill out personal information/waivers/medical history. Claim first free pole class under membership then book the free class on the date and time that you want. Did you know Ripley has a girls football team? There sessions are on a Thursday 7:00 - 8:00pm at Greenwich Park in Ripley. "The girls are Ripley Towns under 16's and last season they won the Derbyshire Girls and Ladies Under 15's County Championship. They won it with 2 games still to go. It's an 11 a side team and we've had just 13 consistent players all season. The girls go to Ripley Academy, Swanwick Hall and John Flamstead's schools and earlier in the season they won the 'Charity Shield' and now they've won the league, which has been a massive achievement. We'd love to have some more players, you'll be welcome regardless of your playing ability. It's all about having fun, making friends as well as kicking a ball. 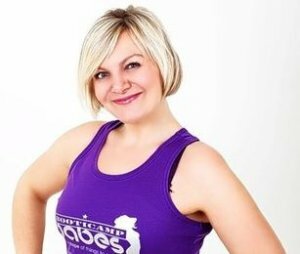 Booticamp Babes creator and Belper/Codnor instructor Sarah (AKA Booti Momma) has been helping to get women active since beginning her own journey to get fit. "I have been on my own personal weight loss journey nearly all of my adult life and I can completely identify with ALL women who are overweight and lacking confidence. You see, since I can remember, I was always an overweight child. 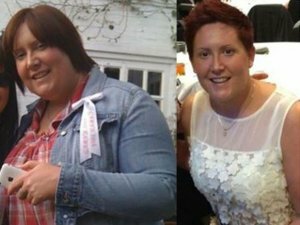 "After the birth of my gorgeous daughter Ellie 14 years ago, I was on a mission to lose the five stone that I had gained. In 13 years I tried EVERY diet going, you name it I did it, like most women I lost the weight then piled it back on! "It wasn't until 2010, that I tried the concept of clean eating coupled with exercise three to four times a week. I was sceptical at first and I was horrified at what I had to cut out of my 'normal' diet! "However, I saw my weight literally fall off - in four short weeks I dropped a dress size and lost 9lbs and since following this lifestyle choice, I have lost a further 10lbs and have NEVER put that weight back on again, although I am human and like EVERY women, I can fluctuate a few pounds here and there. "I launched Booticamp Babes in July 2012 and along with my fantastic team, we help women understand their bodies and show them how to take control of their lifestyle, say goodbye to faddy diets, yo-yo-ing weight loss/gain. "We help them to cope with life's demands and support them if they are suffering with low self esteem, desperation, depression, comfort eating and despair. We help them learn or love their bodies by becoming fitter and healthier. "We provide weekly nutritional plans, including recipes and tips and we have a secret Facebook group dedicated to our members to give them as much motivation and support as we can so we can help them achieve their goals. 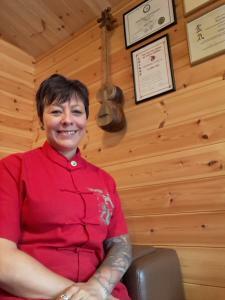 "Alongside all of my fitness qualifications gained, including Level 2 fitness, Boxercise, Nutrition, Older Adults, GP Referral and Kettlecise, I am also a nurse with over 19 years experience, 13 of those years specialising in Aesthetics - which is another passion of mine - helping women to look and feel good from the inside out is my absolute passion. "Along with my amazingly loyal, dedicated, fantastic team, I currently run 25 Booticamp sessions a week in various locations throughout Derbyshire and Nottinghmashire and have recently opened a camp in Birmingham too." Please get in touch with me on 0781 6869626 or e-mail sarah@booticampbabes.co.uk. Mum and Derby Telegraph Digital Football Writer Kerry, 36, from Heage, worked her way back to fitness after taking time out. "I've always enjoyed sport and keeping fit; I danced as a youngster and played netball. And I held the school long jump record for five years! "But when I found out I was pregnant with my little boy Samuel, now aged nine, I took some time off. "Getting back into exercise after having a baby can be tough, nerve-wracking even. I had stretch marks which made me self-conscious, wobbly bits which I hadn't had before and the thought of walking into a room full of people who, in my mind, were thin, toned and athletic, scared me. "My weight rocketed and, as an early Christmas present, my husband, Nick, bought me a year's gym membership at Ripley Leisure Centre. "It was the best present ever. Staff were brilliant; they encouraged me, praised me and made me feel fantastic! "My confidence grew and I started regularly attending classes like Body Combat, Sh'Bam and Body Pump. The teachers – Steph Burton, Kathy Smith, Steve Summers, Simon Donlan and Kerry York – have all been amazing and they too, have such inspirational fitness stories. Steve is a retired fire-fighter who almost lost his life in an accident; he piled on the pounds and, at his heaviest, was 21 stone. "The Leisure Centre have daytime and evening classes, so there is often one that fits in around looking after the children. "I've not only lost weight but I've toned up, made some fab friends and I feel so much better. I'm more confident, healthy and alert. 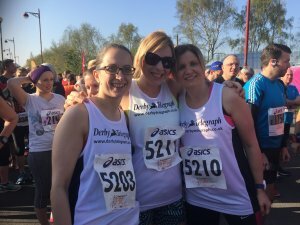 "I've also enjoyed getting back into running with the Jog Derbyshire group in Ripley and, since joining them, have competed in my first 10k run. 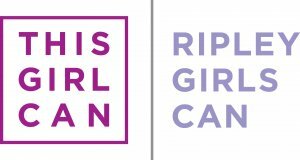 "The Ripley Girls Can campaign is great at highlighting the variety of sport and activity on offer in our town. "Remember, everyone has to start somewhere. You won't regret it!" Get in touch with me at @KerryGanly or https://www.instagram.com/kezzaganly/, and I'll try and answer any questions you may have. I look forward to hearing from you. Ripley woman Sally Green has put her body image issues behind her and carved out a new career as a fitness instructor. "Firstly, I think that the Ripley Girls Can campaign is fantastic! I played sport when I was younger, and carried on with fitness when I joined the Navy. "Having had my own body image issues and being really overweight to the point it impacted on my health, I can really relate to those who are worried about taking those fearful first steps! "I used to think when the doctor told me to lose some weight he was just using it as an excuse and rebelled a bit... but guess what, he wasn't wrong! "I have battled with my weight the last few years and passed my fitness qualifications and finally I am ready to use my experiences to help others, and to prove that fitness and the instructors are not a one size fits all! "It's not all hard work and no play...because that's not the world we live in, it's about fitting in what activity we can into already busy lives! "I have recently given up my 'big girl' job and currently work at Group Fitness in Loscoe. We have a fantastic bunch of instructors here and no-one is made to feel self conscious or uncomfortable... I absolutely love my job. "We offer varying levels of classes and personal training sessions to suit everyone from beginners to marathon runners." If you'd like to give Group Fitness a go, please get in touch with me. I can answer any of your questions, and can meet you there and show you the ropes. No question is too silly. Contact me on sallygreen82@gmail.com. I hope to hear from you soon. Rachel's main passion is tennis, a sport she loves! Hi, my name is Rachel and I am part of Ripley and Alfreton Tennis Club. 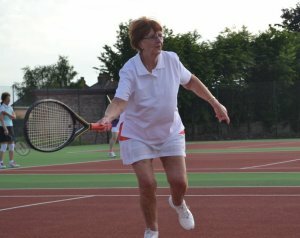 We have just had a brand new clubhouse and new tennis courts, and we'd love to see you. We have all the equipment you'll need. We have a Ladies only night each week. We run a Rusty Rackets session, which is perfect for those who have not played since school. You don't have to be a member to join in. If you'd like to talk to someone about tennis, I can help. Please contact me on rachel@ripleyalfretontennis.org.uk. Dominique is primarily based at The Genesis Centre, in Alfreton. Helping women to grow their confidence, love themselves for who they are, and creating positivity is what Dominique is all about. Dominique offers a range of classes, from Bokwa, to Xena, Power Mats and more. She also runs a programme of healthy eating. To get in contact find Dominique on Facebook. 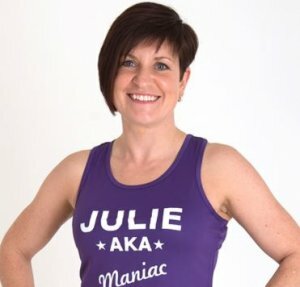 A passion for dance has seen Ripley Booticamp Babes instructor Julie (AKA Maniac) rediscover her love for staying active. "I've had a love of dance since I was three years old and this led into a passion for health and fitness after leaving school. Following the arrival of my two gorgeous daughters, I struggled to lose the weight and get back in shape despite trying various fad diets! "Then I found Booticamp Babes - it's the only plan that has ever worked for me and I have never been in better shape, I'm the slimmest I've been and healthier than ever before! "I was delighted to become a Booticamp Babes trainer and feel so privileged to be part of such a fantastic team, I absolutely love my job as it gives me great satisfaction knowing that I can help women of all shapes and sizes transform their lives for the better. "I also enjoy a variety of fitness classes,including spin and boxing. 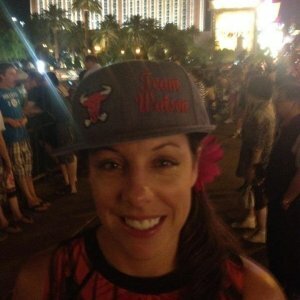 I am also a keen runner and have completed numerous 10ks, half marathons and X Runner events. "I teach classes mainly at Ripley and Little Eaton, but you will also see me at Belper and Codnor. 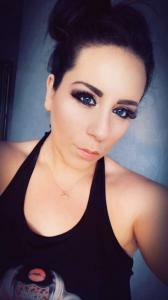 "I am a qualified Level 3 Personal Trainer which, in addition to Booticamp, enables me to train women on a one to one basis, who wish to achieve a certain goal or level of fitness, whether it be for a wedding, holiday, or other special occasion. 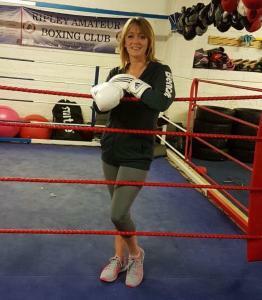 "I am also a Boxercise certified instructor and have also gained qualifications in Nutrition and Older Adults. I am currently undertaking an assessors course, which will enable me to train all new trainers that come on board in the future! "My aims for my clients are for them to be healthy and happy and achieve whatever goals their hearts desire! "I take an active interest in ALL my members body transformations and have a fabulous team that are here to keep them on track with their goals." Please get in touch with me on 0781 6869626 or e-mail julie@booticampbabes.co.uk. "My focus is on helping people enjoy the benefits of fitness and boxing training. I enjoy working with women who have never put on a pair of boxing gloves or stepped in a gym, and seeing how it transforms their lives. "I graduated from Loughborough University with a 1st Class Honours in Sport and Exercise science in 2003 whilst competing internationally at basketball. I then started my career as a Sports Science lecturer, moving abroad to Hong Kong to work as a personal trainer and eventually moved into sports development. I have won national championships in Boxing. "If you'd like to get in touch please contact me via Facebook at Complete Body Engineering. Here, we run a small gym, with boxing and a range of classes. We are based in Denby. We hope to hear from you soon."